(CNS): During the opening plenary session of XIX International AIDS Conference (AIDS 2012), Secretary of State of USA Hillary Rodham Clinton made a fervent appeal to end the epidemic of AIDS and hoped to be able to stop the AIDS Memorial Quilt (which has the names of all those Americans who have died of AIDS) from growing any further. It is disappointing that not one of the distinguished speakers made even a passing reference about the need to control the spread of the tuberculosis (TB) bacteria, which stalks the earth hand in hand with the HIV virus and is the biggest cause of deaths among people living with HIV (PLHIV). Activists and health advocates however used this major opportunity to draw attention to TB/HIV by wearing face masks when Clinton was speaking. This activism has put the spotlight once again on the urgent need for better access to and research on life-saving tools and programs to fight TB/HIV. According to the latest data, one in every four deaths among HIV positive people occur due to preventable and curable TB. No one needs to die of TB. Or HIV. TB and HIV form a deadly combination. In 2010, 350,000 people died of HIV-associated TB. With more than one million people needing simultaneous treatment for TB and HIV, it is essential that health systems coordinate their services to provide effective care. TB is curable and should not be the leading cause of death for PLHIV. The two diseases are closely linked because TB is frequently the first opportunistic infection in PLHIV. 1.1 million people needed simultaneous treatment for both diseases in 2009 — 80% of them in sub-Saharan Africa. 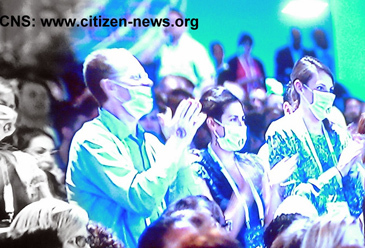 At the last 2010 XVIII International AIDS Conference in Vienna, the correspondents of Citizen News Service (CNS) and thousands of other delegates witnessed one of the defining moments of AIDS activism when the TB cough-in/coffin March took place. At least half a thousand people had assembled, with t-shirts, placards, cardboard coffins (no more TB deaths), stop TB handkerchiefs/ bandanas, vuvuzelas, drums, banners, and mascots to name a few. AIDS activism has been a cornerstone of AIDS conferences, but TB was on its agenda this time, as never before. Hundreds of marchers coughed into the handkerchiefs/ bandanas intermittently and then the growing sloganeering at deafening decibels of ‘When you cough, when you sneeze, cover your mouth to stop TB’, “No more people living with HIV (PLHIV) dying of TB”, “HIV Positive, Prevent TB”, and “If a virus (HIV) and a bacteria (TB) can work so well together, then why can’t we?”, were among the slogans we still recollect today two years after the Vienna AIDS 2010 while we witness activists with face masks demanding more attention to TB-HIV at AIDS 2012. Another grim reminder is the historic commitment of global leaders in TB and HIV responses to respond as never before to TB-HIV related issues. At the AIDS 2010 in Vienna, the Stop TB Partnership had signed a memorandum of understanding (MoU) with the Joint United Nations programme on HIV/AIDS (UNAIDS) to work together in improving responses to TB and HIV. Clearly not enough has been done on scaling up TB-HIV collaborative activities in order to save lives of PLHIV who die of TB - which led the delegates of AIDS 2012 to wear face masks and demand more attention to TB-HIV related issues. Women living with HIV are 10 times more likely to develop TB during pregnancy than women who are HIV-negative. TB during pregnancy doubles the risk of transmission of HIV from a mother to her child. Communities are at special risk when women are ill with TB. Families lose income, and children miss out on educational opportunities. TB has been neglected in children, yet it causes suffering and death all over the world, especially in communities affected by HIV. Mortality due to TB in HIV infected children is 5 to 6 times higher than in HIV negative children. TB and HIV hit communities hard. People with TB often suffer from discrimination, rejection and isolation. This means that people with TB are less likely to complete their treatment, putting their families and friends at risk and fuelling the development of drug-resistant forms of the disease. People with TB are often too sick to work or go to school, and this simply compounds the problems of PLHIV. The dual HIV-TB epidemic poses a challenge for both TB and HIV efforts at all levels. Thus early diagnosis, timely initiation of treatment for both diseases and careful monitoring are essential to treat TB in PLHIV and identify HIV infection in people with TB. The main obstacles to managing patients with TB and HIV co-infection are weak coordination between TB and HIV programmes and slow integration of collaborative TB-HIV services into the general health services. These challenges often have an adverse impact on patients’ treatment access and outcomes.